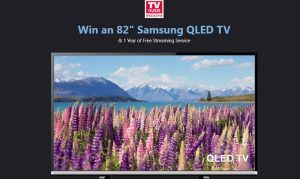 Win an 82″ Samsung QLED TV! Prize: One Grand Prize will be awarded in this Giveaway. The Grand Prize consists of one 82″ Samsung QLED TV or equivalent along with one free year of the streaming service of winner’s choice not to exceed $250. The streaming portion of the prize will be awarded to the winner in the form of a $250 check. Total approximate retail value of prize not to exceed $4,749.